Pioneers in the industry, we offer brc genius max reducer (vaporizer) repair kit from India. regeneration kit of diaphragms, membranes, sealings, filters for BRC Genius Max autogas, LPG reducer/regulator/vaporizer. 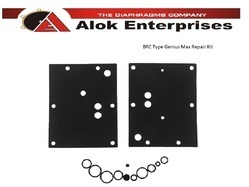 Looking for BRC Diaphragm Repair Kit ?